Download "Economic Impact of Skidmore College on Saratoga County"
2 Economic Impact of Skidmore College on Saratoga County Page 1 Economic Impact of Skidmore College on Saratoga County INTRODUCTION TO THE RIMS II MODEL Effective planning for public- and private-sector projects and programs at the State and local level requires a systematic analysis of the economic impacts of projects and programs on the affected regions. In turn, systematic analysis of economic impacts must take into account inter-industry relationships within regions because these relationships largely determine how regional economies are likely to respond to project and program changes. Thus, regional input-output (I-O) multipliers which account for inter-industry relationships within regions are useful tools for regional economic impact analysis. 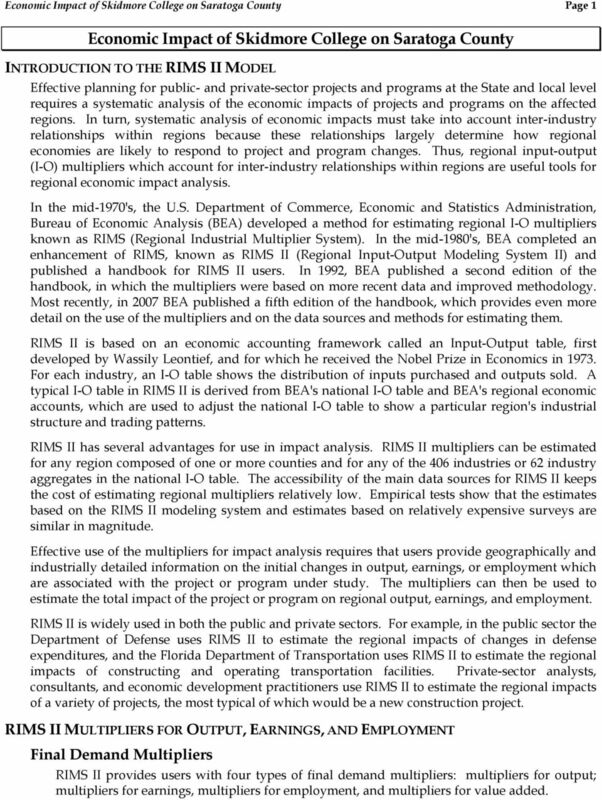 In the mid-1970's, the U.S. Department of Commerce, Economic and Statistics Administration, Bureau of Economic Analysis (BEA) developed a method for estimating regional I-O multipliers known as RIMS (Regional Industrial Multiplier System). In the mid-1980's, BEA completed an enhancement of RIMS, known as RIMS II (Regional Input-Output Modeling System II) and published a handbook for RIMS II users. In 1992, BEA published a second edition of the handbook, in which the multipliers were based on more recent data and improved methodology. Most recently, in 2007 BEA published a fifth edition of the handbook, which provides even more detail on the use of the multipliers and on the data sources and methods for estimating them. RIMS II is based on an economic accounting framework called an Input-Output table, first developed by Wassily Leontief, and for which he received the Nobel Prize in Economics in For each industry, an I-O table shows the distribution of inputs purchased and outputs sold. 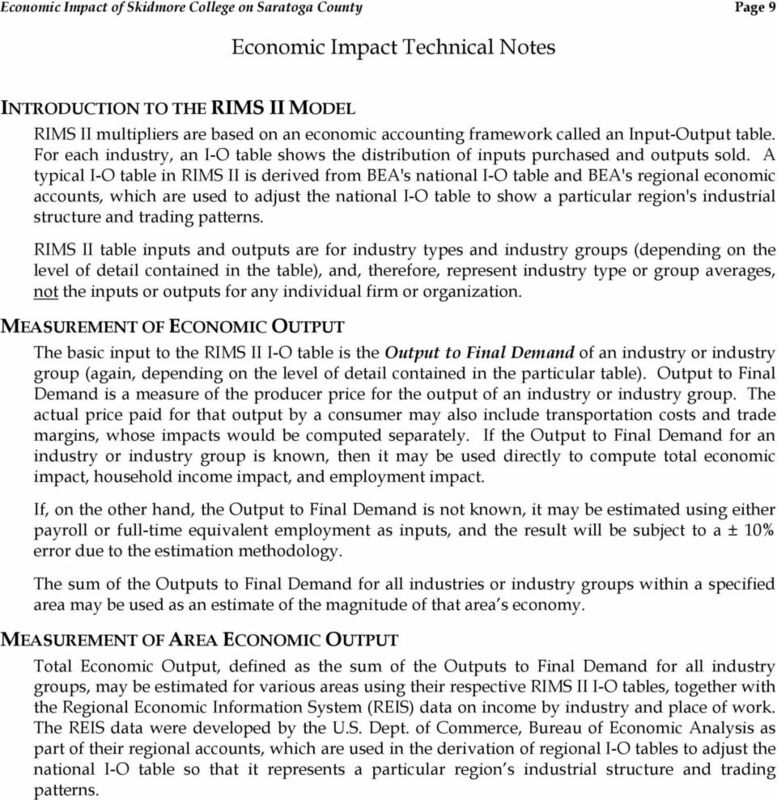 A typical I-O table in RIMS II is derived from BEA's national I-O table and BEA's regional economic accounts, which are used to adjust the national I-O table to show a particular region's industrial structure and trading patterns. RIMS II has several advantages for use in impact analysis. RIMS II multipliers can be estimated for any region composed of one or more counties and for any of the 406 industries or 62 industry aggregates in the national I-O table. The accessibility of the main data sources for RIMS II keeps the cost of estimating regional multipliers relatively low. Empirical tests show that the estimates based on the RIMS II modeling system and estimates based on relatively expensive surveys are similar in magnitude. Effective use of the multipliers for impact analysis requires that users provide geographically and industrially detailed information on the initial changes in output, earnings, or employment which are associated with the project or program under study. The multipliers can then be used to estimate the total impact of the project or program on regional output, earnings, and employment. RIMS II is widely used in both the public and private sectors. For example, in the public sector the Department of Defense uses RIMS II to estimate the regional impacts of changes in defense expenditures, and the Florida Department of Transportation uses RIMS II to estimate the regional impacts of constructing and operating transportation facilities. Private-sector analysts, consultants, and economic development practitioners use RIMS II to estimate the regional impacts of a variety of projects, the most typical of which would be a new construction project. RIMS II MULTIPLIERS FOR OUTPUT, EARNINGS, AND EMPLOYMENT Final Demand Multipliers RIMS II provides users with four types of final demand multipliers: multipliers for output; multipliers for earnings, multipliers for employment, and multipliers for value added. 3 Economic Impact of Skidmore College on Saratoga County Page 2 Final Demand Multipliers for Output The final demand multipliers for output are the basic multipliers from which all other multipliers are derived. They are presented in the final demand output multiplier tables (RIMS II Table 1-1 & Table 2-1). In these tables, each entry indicates the change in output in each column industry group that results from a $1.00 change in final demand (producer price) for the row industry. The impact on each column industry group is calculated by multiplying the final demand change in the row industry by the multiplier at the intersection of the row and column. The total impact on regional output is calculated by multiplying the final demand change in the row industry by the sum of all the multipliers for the columns except the household column, which is excluded to avoid double counting, since each of the other column entries includes household earnings. Final Demand Multipliers for Earnings The final demand multipliers for earnings are derived directly from the final demand output multipliers tables and are used for estimating earnings impacts. In the final demand earnings multiplier tables (RIMS II Table 1-2 & Table 2-2), each entry indicates the change in household earnings in each column industry group that results from a $1.00 change in final demand (producer price) for the row industry. The impact on each column industry group is calculated by multiplying the final demand change in the row industry by the multiplier at the intersection of the row and column. The total impact on regional household earnings is calculated by multiplying the final demand change in the row industry by the sum of the multipliers for the columns. 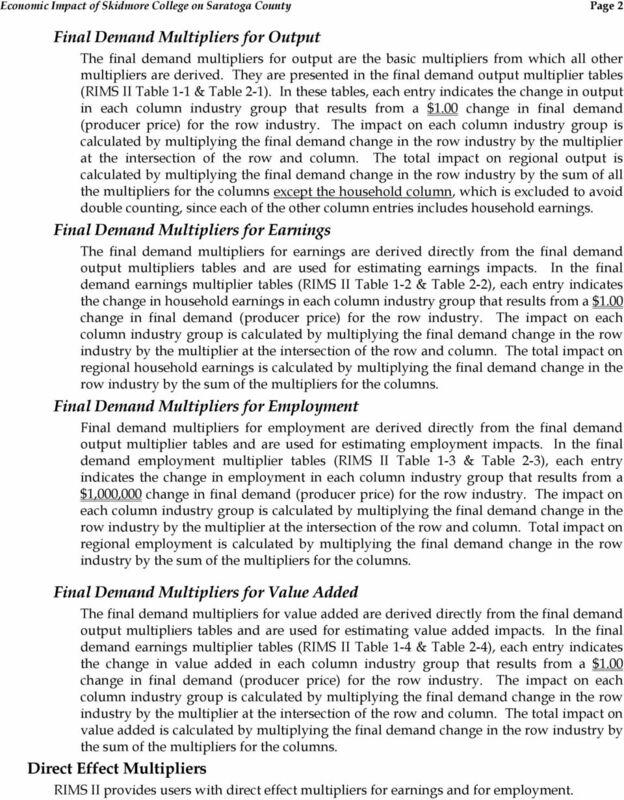 Final Demand Multipliers for Employment Final demand multipliers for employment are derived directly from the final demand output multiplier tables and are used for estimating employment impacts. In the final demand employment multiplier tables (RIMS II Table 1-3 & Table 2-3), each entry indicates the change in employment in each column industry group that results from a $1,000,000 change in final demand (producer price) for the row industry. The impact on each column industry group is calculated by multiplying the final demand change in the row industry by the multiplier at the intersection of the row and column. Total impact on regional employment is calculated by multiplying the final demand change in the row industry by the sum of the multipliers for the columns. Final Demand Multipliers for Value Added The final demand multipliers for value added are derived directly from the final demand output multipliers tables and are used for estimating value added impacts. In the final demand earnings multiplier tables (RIMS II Table 1-4 & Table 2-4), each entry indicates the change in value added in each column industry group that results from a $1.00 change in final demand (producer price) for the row industry. The impact on each column industry group is calculated by multiplying the final demand change in the row industry by the multiplier at the intersection of the row and column. The total impact on value added is calculated by multiplying the final demand change in the row industry by the sum of the multipliers for the columns. Direct Effect Multipliers RIMS II provides users with direct effect multipliers for earnings and for employment. 4 Economic Impact of Skidmore College on Saratoga County Page 3 Direct Effect Multipliers for Earnings Direct effect multipliers for earnings are derived directly from the final demand output multiplier table. The direct effect multipliers for earnings can be used if data on the initial changes in earnings by industry are available. 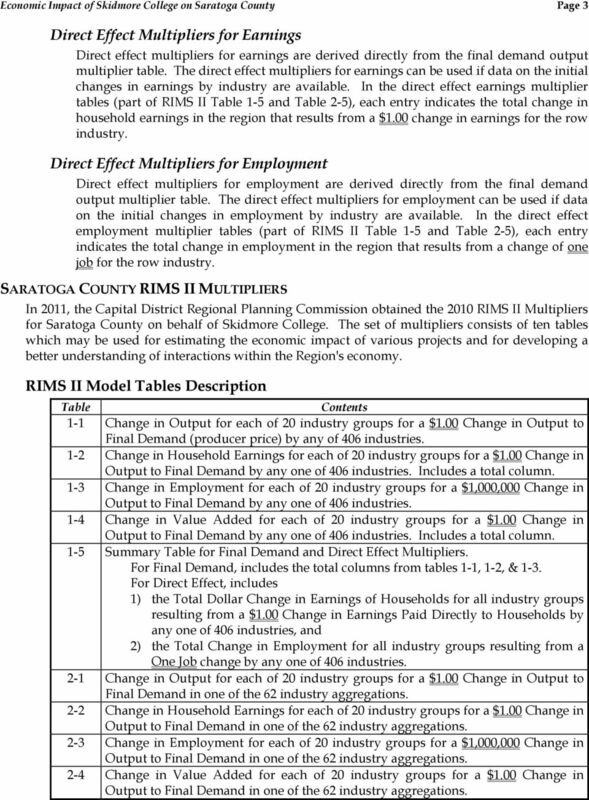 In the direct effect earnings multiplier tables (part of RIMS II Table 1-5 and Table 2-5), each entry indicates the total change in household earnings in the region that results from a $1.00 change in earnings for the row industry. Direct Effect Multipliers for Employment Direct effect multipliers for employment are derived directly from the final demand output multiplier table. The direct effect multipliers for employment can be used if data on the initial changes in employment by industry are available. In the direct effect employment multiplier tables (part of RIMS II Table 1-5 and Table 2-5), each entry indicates the total change in employment in the region that results from a change of one job for the row industry. 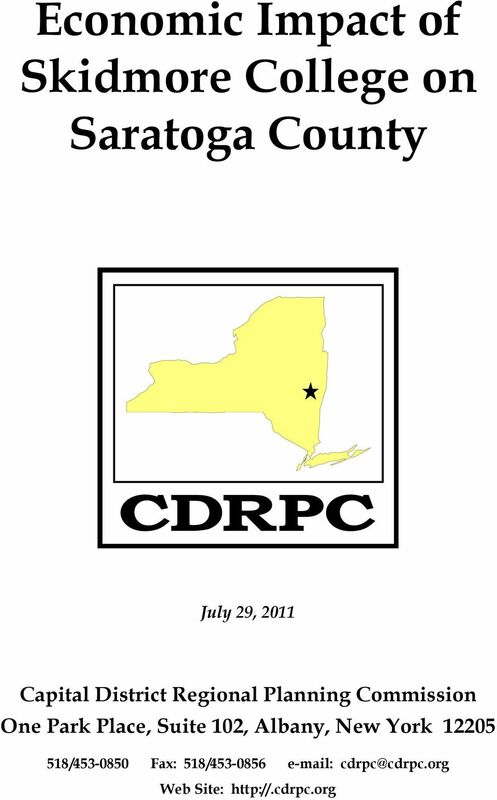 SARATOGA COUNTY RIMS II MULTIPLIERS In 2011, the Capital District Regional Planning Commission obtained the 2010 RIMS II Multipliers for Saratoga County on behalf of Skidmore College. The set of multipliers consists of ten tables which may be used for estimating the economic impact of various projects and for developing a better understanding of interactions within the Region's economy. RIMS II Model Tables Description Table Contents 1-1 Change in Output for each of 20 industry groups for a $1.00 Change in Output to Final Demand (producer price) by any of 406 industries. 1-2 Change in Household Earnings for each of 20 industry groups for a $1.00 Change in Output to Final Demand by any one of 406 industries. Includes a total column. 1-3 Change in Employment for each of 20 industry groups for a $1,000,000 Change in Output to Final Demand by any one of 406 industries. 1-4 Change in Value Added for each of 20 industry groups for a $1.00 Change in Output to Final Demand by any one of 406 industries. Includes a total column. 1-5 Summary Table for Final Demand and Direct Effect Multipliers. For Final Demand, includes the total columns from tables 1-1, 1-2, & 1-3. For Direct Effect, includes 1) the Total Dollar Change in Earnings of Households for all industry groups resulting from a $1.00 Change in Earnings Paid Directly to Households by any one of 406 industries, and 2) the Total Change in Employment for all industry groups resulting from a One Job change by any one of 406 industries. 2-1 Change in Output for each of 20 industry groups for a $1.00 Change in Output to Final Demand in one of the 62 industry aggregations. 2-2 Change in Household Earnings for each of 20 industry groups for a $1.00 Change in Output to Final Demand in one of the 62 industry aggregations. 2-3 Change in Employment for each of 20 industry groups for a $1,000,000 Change in Output to Final Demand in one of the 62 industry aggregations. 2-4 Change in Value Added for each of 20 industry groups for a $1.00 Change in Output to Final Demand in one of the 62 industry aggregations. 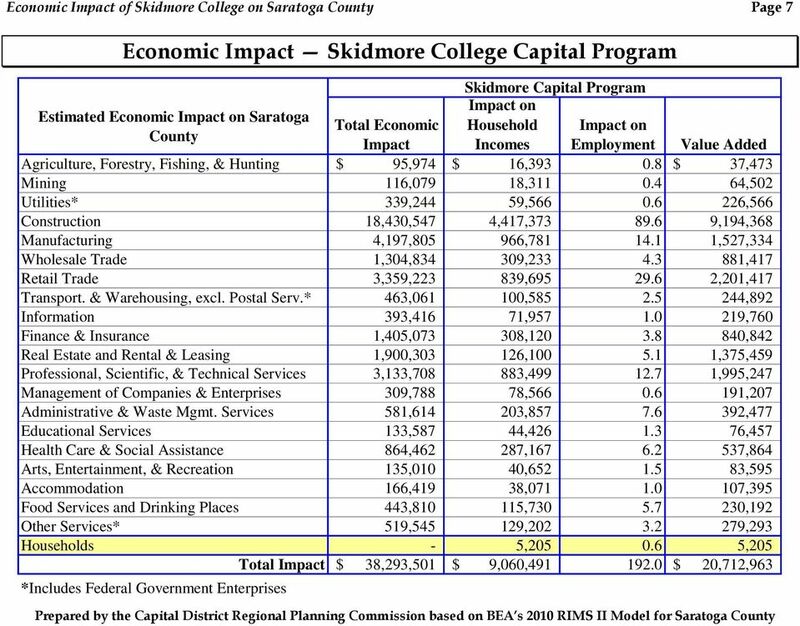 5 Economic Impact of Skidmore College on Saratoga County Page Summary Table for Final Demand and Direct Effect Multipliers. For Final Demand, includes the total columns from tables 2-1, 2-2, & 2-3. For Direct Effect, includes 1) the Total Dollar Change in Earnings of Households for all industry groups resulting from a $1.00 Change in Earnings Paid Directly to Households by any one of the 62 industry aggregations, and 2) the Total Change in Employment for all industry groups resulting from a One Job change by any one of the 62 industry aggregations. The RIMS II multiplier tables can be acquired for any region composed of one or more counties from the U.S. Dept. of Commerce, Bureau of Economic Analysis 202/ , or Economic Impact Analysis Using the RIMS II Model Given estimates of output to final demand (e.g., construction costs and total sales) for a specific project, the final demand multipliers allow estimation of the project s total economic impact on Saratoga County, the total change in County household earnings, the total change in County employment, and an estimate of value added, as well as individual changes in output, household earnings, and employment for each of 20 Saratoga County industry groups. The total County impact of any project will include, besides direct project expenditures and employment, the impact on secondary, tertiary, and other industries such as transportation; communications; publishing; wholesale trade; finance, insurance, and real estate; medical and business services, etc. Using estimates of earnings (i.e., payroll) or employment (full-time equivalents) for a project, the direct effect multipliers allow estimation of the project s total impact on County household earnings and employment. With estimates of earnings or employment for a project often easier to determine than a producer s output to final demand it is also possible to estimate the output to final demand and total economic impact of a project using a function of the final demand and direct effect multipliers. The 2011 Saratoga County model is based on the North American Industrial Classification System (NAICS) industries and industry groups. 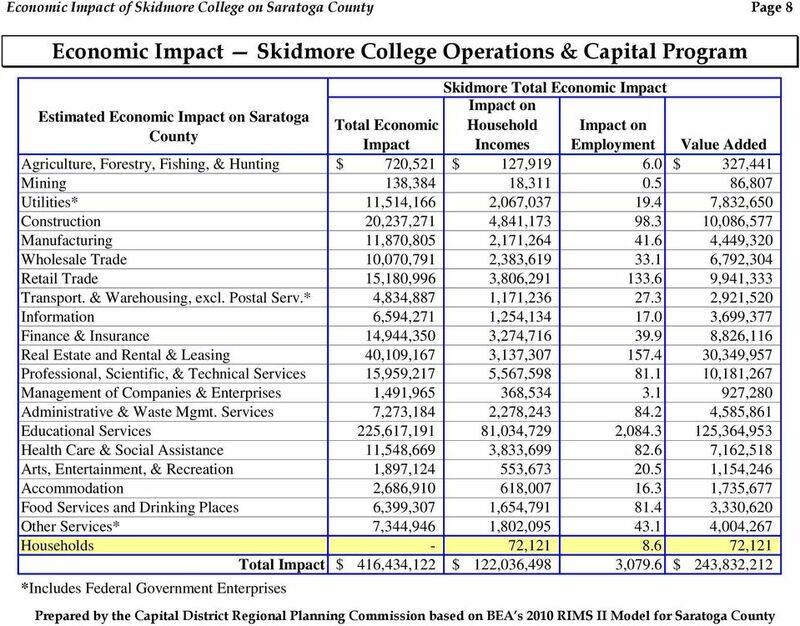 ECONOMIC IMPACT OF SKIDMORE COLLEGE ON SARATOGA COUNTY Using estimates of $80,257,000 for total payroll with benefits, and capital expenditure 10-year annual averages of $1,518,169 for design services, $18,311,354 for construction, $1,536,793 for furniture and furnishings, and $2,601,209 for information technology, estimates for total economic impact, household income impact, employment impact, and value added on Saratoga County of Skidmore College were computed using Saratoga County 2011 RIMS II input/output tables. The estimated economic impacts refer to annual impacts, since the most recent five-year and future five-year capital expenditure budgets were converted to annual averages. The estimated annual economic impacts for operations expenditures of Skidmore College on each of the County's 20 industry groups are detailed in the first table below. The total annual economic impact of operations is estimated to be $378,140,621, while the annual impact on household incomes is approximately $112,976,007, and the annual employment impact on the County is approximately 2,888 total jobs. The value added from operations activities is estimated to be $223,119,249. Since the output and impact estimates were based on payroll, they are subject to a ± 10% error. Note that the table displays both the direct and indirect impacts of College operations, so the Educational Services category is particularly high. 6 Economic Impact of Skidmore College on Saratoga County Page 5 The estimated average annual economic impacts for the College's capital program on each of the County's 20 industry groups are detailed in the second table below. The total annual economic impact of the capital program is estimated to be $38,293,501, while the annual impact on household incomes is approximately $9,060,491, and the annual employment impact on the County is approximately 192 total jobs. The value added from the capital program is estimated to be $20,712,963 Finally, the total (operations + capital program) estimated average annual economic impacts of the College on each of the County's 20 industry groups are detailed in the third table below. The total annual economic impact is estimated to be $416,434,122, while the annual impact on household incomes is approximately $122,036,498, and the annual employment impact on the County is approximately 3,080 total jobs. The total value added is estimated to be $243,832,212. 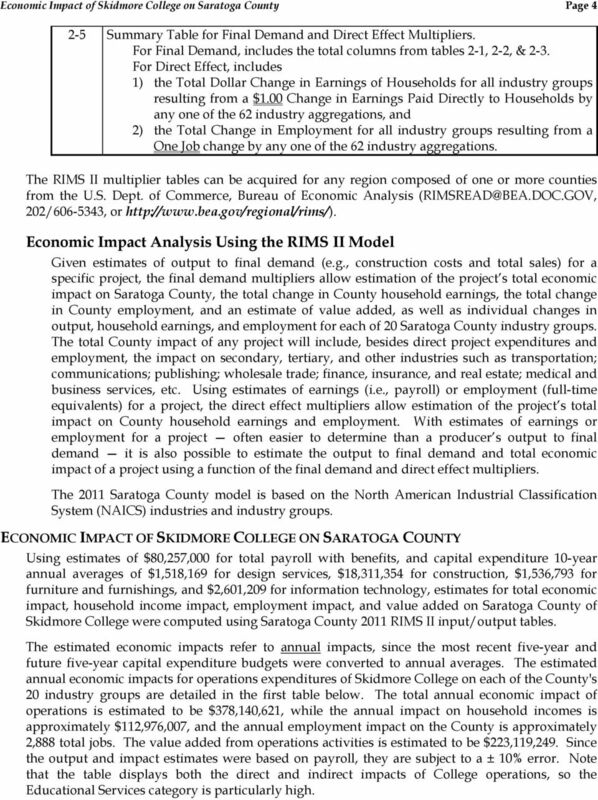 10 Economic Impact of Skidmore College on Saratoga County Page 9 Economic Impact Technical Notes INTRODUCTION TO THE RIMS II MODEL RIMS II multipliers are based on an economic accounting framework called an Input-Output table. For each industry, an I-O table shows the distribution of inputs purchased and outputs sold. A typical I-O table in RIMS II is derived from BEA's national I-O table and BEA's regional economic accounts, which are used to adjust the national I-O table to show a particular region's industrial structure and trading patterns. RIMS II table inputs and outputs are for industry types and industry groups (depending on the level of detail contained in the table), and, therefore, represent industry type or group averages, not the inputs or outputs for any individual firm or organization. MEASUREMENT OF ECONOMIC OUTPUT The basic input to the RIMS II I-O table is the Output to Final Demand of an industry or industry group (again, depending on the level of detail contained in the particular table). Output to Final Demand is a measure of the producer price for the output of an industry or industry group. The actual price paid for that output by a consumer may also include transportation costs and trade margins, whose impacts would be computed separately. If the Output to Final Demand for an industry or industry group is known, then it may be used directly to compute total economic impact, household income impact, and employment impact. If, on the other hand, the Output to Final Demand is not known, it may be estimated using either payroll or full-time equivalent employment as inputs, and the result will be subject to a ± 10% error due to the estimation methodology. The sum of the Outputs to Final Demand for all industries or industry groups within a specified area may be used as an estimate of the magnitude of that area s economy. MEASUREMENT OF AREA ECONOMIC OUTPUT Total Economic Output, defined as the sum of the Outputs to Final Demand for all industry groups, may be estimated for various areas using their respective RIMS II I-O tables, together with the Regional Economic Information System (REIS) data on income by industry and place of work. The REIS data were developed by the U.S. Dept. of Commerce, Bureau of Economic Analysis as part of their regional accounts, which are used in the derivation of regional I-O tables to adjust the national I-O table so that it represents a particular region s industrial structure and trading patterns. 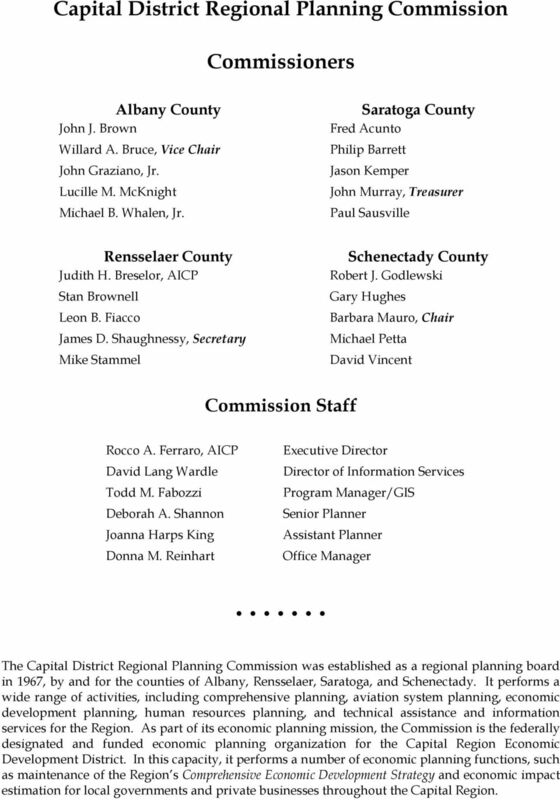 11 Capital District Regional Planning Commission Commissioners Albany County John J. Brown Willard A. Bruce, Vice Chair John Graziano, Jr. Lucille M. McKnight Michael B. Whalen, Jr. Saratoga County Fred Acunto Philip Barrett Jason Kemper John Murray, Treasurer Paul Sausville Rensselaer County Judith H. Breselor, AICP Stan Brownell Leon B. Fiacco James D. Shaughnessy, Secretary Mike Stammel Schenectady County Robert J. Godlewski Gary Hughes Barbara Mauro, Chair Michael Petta David Vincent Commission Staff Rocco A. Ferraro, AICP David Lang Wardle Todd M. Fabozzi Deborah A. Shannon Joanna Harps King Donna M. Reinhart Executive Director Director of Information Services Program Manager/GIS Senior Planner Assistant Planner Office Manager The Capital District Regional Planning Commission was established as a regional planning board in 1967, by and for the counties of Albany, Rensselaer, Saratoga, and Schenectady. It performs a wide range of activities, including comprehensive planning, aviation system planning, economic development planning, human resources planning, and technical assistance and information services for the Region. As part of its economic planning mission, the Commission is the federally designated and funded economic planning organization for the Capital Region Economic Development District. In this capacity, it performs a number of economic planning functions, such as maintenance of the Region s Comprehensive Economic Development Strategy and economic impact estimation for local governments and private businesses throughout the Capital Region. $1,995.00 2014 U.S. MARKET ANALYSIS: SAFETY MRO DATA ESTIMATED END-USER DEMAND BY REGION & END-MARKET researched & produced by: www.imidata.com www.mdm.com 2014 by Gale Media Inc. All rights reserved.